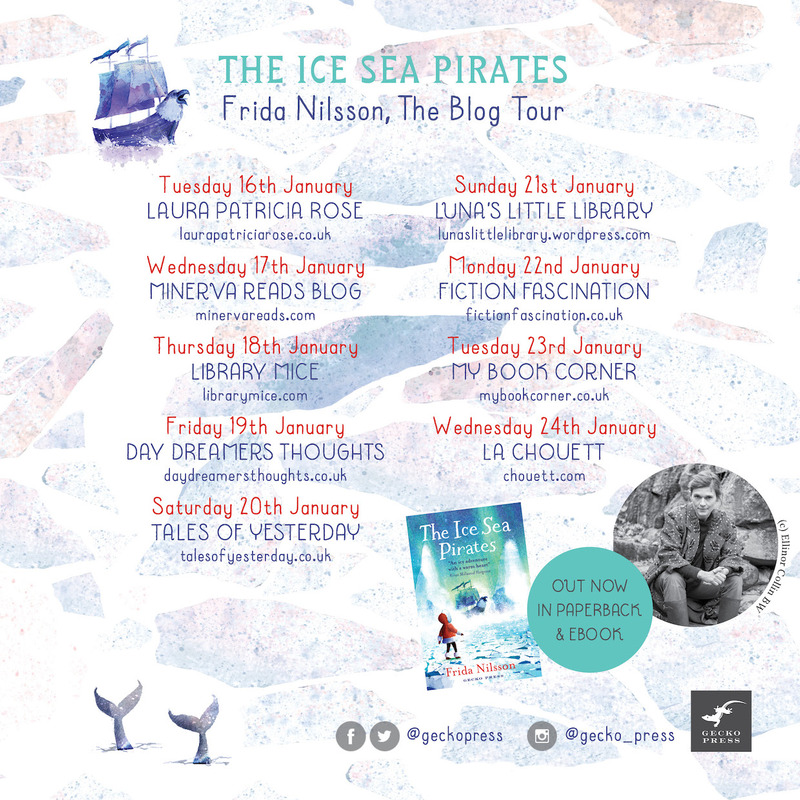 I’m delighted to showcase The Ice Sea Pirates by Frida Nilsson, illustrated by David Barrow, on the blog today. 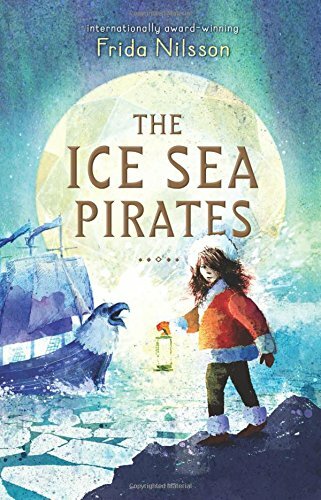 Nilsson’s latest book, The Ice Sea Pirates, is a classic children’s adventure story about a girl called Siri who dares to trek the ice seas and face down fearsome leader of pirates Captain Whitehead, in order to rescue her sister. This is a survival story set in a wild landscape of our dreams and nightmares – seas that freeze over with extreme cold and lash ships to pieces with their ice shards – a troop of pirates who capture children to work down a mine – ferocious wolves who wander the ice looking for prey. But above all, this is a hugely compelling read with a sympathetic, staggeringly brave and wholesome main character, and a gripping narrative. It’s no wonder the book has been nominated for five Swedish book awards, and won three of them. Now, available in English, translated by Peter Graves, and softly and warmly illustrated by David Barrow, this is really a sumptuous read. “The scenery is very important I think, in order to convince the reader that I am “telling the truth”. That doesn’t mean that the description of the scenery most be very long. In fact, I heard a Swedish writer say once: the longer and more thorough the scenery is, the surer you can be that the writer was never there for real. To describe the scenery in a short and vigorous manner is not easy. 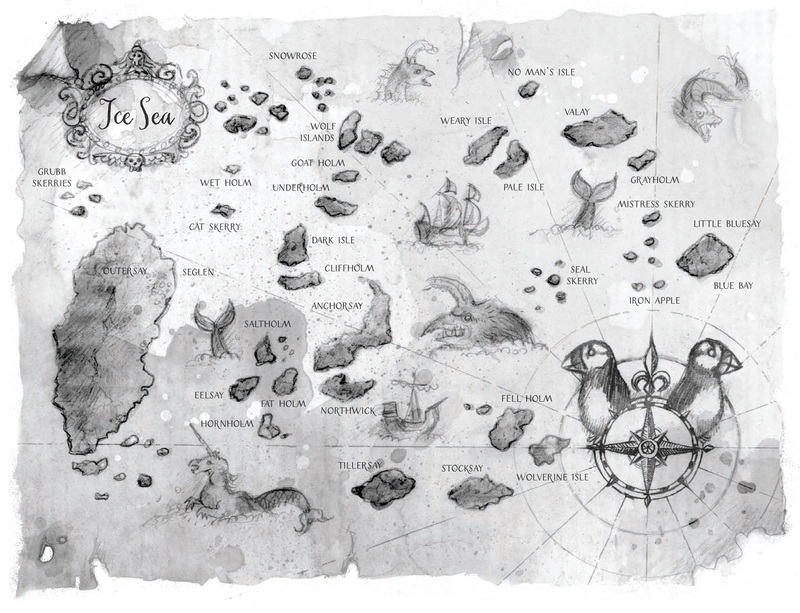 The Ice Sea Pirates is a fictional world with, of course, strong impressions from the Arctic. I went to Tromsö (northern Norway) with my mother once. She worked at the hospital there and I had the days all to myself to wander about and go to the local museum, where they had exhibitions about whale- and walrus-hunting. A lot of my ideas for the book come from that trip. Frida’s text is complemented by the softly drawn, mesmeric images from illustrator David Barrow. Below is a selection of the images, which Gecko Press have been kind enough to let me share. You can buy The Ice Sea Pirates here. Women may still be under-represented in the FTSE 100 companies, but the number of strong female characters in middle grade fiction continues to rise. Ruth Lauren not only populates her debut novel with a strong female protagonist, a female spy, and a female Head Prison Warden, but also creates a fantasy matriarchal society, in which a queen rules and the line of succession is through her daughter. This is a pacey first-person text, which reads like a tightly plotted thriller, or a child’s Siberian version of Prison Break. The reader follows Valor in her quest to free her sister, who has been imprisoned for stealing an important royal music box (with diplomatic relevance). The book starts with an action-packed assassination sequence, through which Valor fakes her motive in order to be imprisoned too, and then starts to make plans to break out both herself and her sister. The novel challenges traditional gender-tropes – Valor is a huntress by trade, taking after her mother – and also challenges traditional softness in children’s books. This may be an easy grammatical read for the 8-12-year-old market, but Lauren doesn’t hold back on the harshness of prison life. Most of the novel is set in prison, after seemingly no real justice system, and there is cruel and hard child labour and even crueller living conditions. Partly because the entire novel is set in a frozen landscape, with roaming wolves and biting cold – so the prisoners remain largely exposed to the cold, and the punishments, when they are doled out, utilise the landscape. With the ice-cold landscape and the bond between sisters, the novel will bring to mind Frozen, but this is a much darker, grown up option, without an Olaf, and with, one imagines, fuller-waisted girls. The secondary characters remain largely thus, and there is not much time for thought and depth – the novel skates along the surface with all its intents and purposes focussed on escape. This makes it a page-turning read, and a delightful escape novel for the age group. Luckily for you, I have three copies to give away (UK and IRL only), so please find me on twitter @minervamoan to win one. If you’re not so lucky, you can buy your own copy here. For all the massively regurgitated history that our children devour at school – Henry VIII and his six wives, the first and second world wars, the Romans, there are billions of little historical stories that deserve to be given the insanely wonderful treatment that William Grill affords his books. Grill’s first book was Shackleton’s Journey – not an unknown story in itself – but one that Grill illustrated with distinction and flair. 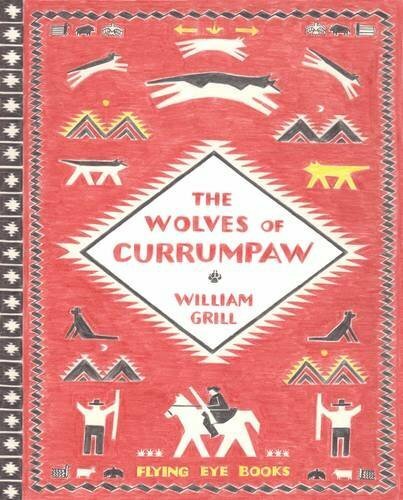 Grill’s latest book is an all-round immersion into the little known story of 1892 New Mexico and the British naturalist Ernest Thompson Seton who is employed to hunt down a roaming wolf pack led by legendary pack leader, King Lobo. This is a sumptuous absorption into the Wild West, with a map at the beginning placing the reader, and a wonderfully depicted opening, ‘The Old West’, with a full page illustration of the vista, in tones of red – smudged trees stretching in zigzags to give the perspective of depth and distance, with a mountain range and a red sky background. In the foreground, a small, almost ant-like pack of wolves roam the landscape. And the reader is transported. There’s a warmth that emanates from the page because of the earthy tones used, but also from the love that has gone into the storytelling. The story branches off using Grill’s now distinctive style of telling the narrative with both huge sweeping images, and also sets of tiny illustrations, almost like film stills in crayon, at first with sparse text, and then with image after image after image. Grill’s brilliance comes from the fact that even by looking at one of his postage stamp illustrations, the reader can tell the character of the man they are reading about – we can see how the European settlers treated the indigenous peoples and animals, and the conflicts they faced. This is especially crucial for children who can visually read ideas and sense emotions that they might not be able to put into words: colonialism, survival, warfare, etc. Small details abound – the train chugging into the distance, weaponry, deals being made. 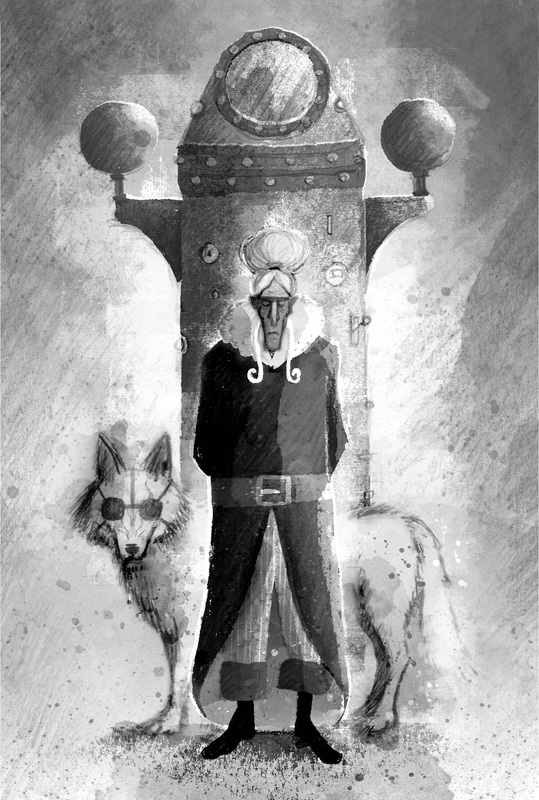 As the story grows, so does the text, but the illustrations still bear that same attention to detail and attitude – the pack of wolves is illustrated – each wolf different from the last. The people too. Browns and blues are introduced into the colour palate, especially as the story heads to Seton in New York and gives the man’s background. 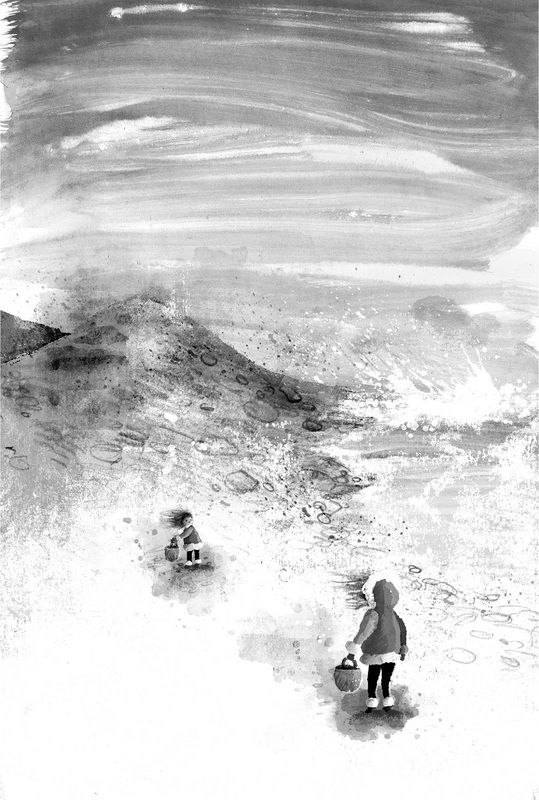 By the time Seton arrives in Clayton, the reader understands the type of man he is, the landscape he is entering, and the equipment he uses – all spread out neatly and illustrated item by item on the page – reminiscent of course of Shackleton’s Journey. This is different though in that it is clear to a modern reader that Shackleton was a hero, but here the reader is torn between rooting for our protagonist, but also for the wolf. In fact, Grill’s excellence is in making the reader feel empathy for both the hunted and the hunter. “Ever since Lobo, my sincerest wish has been to impress upon people that each of our native wild creatures is in itself a precious heritage that we have no right to destroy or put beyond the reach of our children” – Ernest Thompson Seton. He would certainly be proud of this retelling. Grill has clearly researched impeccably, and succeeds in retelling history for a young generation in both highly illustrative detail and highly edited text. Includes also a glossary and wonderful endpapers. Reading a Grill book is like immersing yourself in an experience. From the beautifully textured cover to the crayon renderings within, which a reader can’t help but rub their fingers over, as if the feelings and sentiments inside could be drawn up into the bloodstream. This is how history comes alive. With thanks to Flying Eye Books for my copy. To buy your own click here. Three weeks ago, I visited the Animal Tales exhibition (open until 1st Nov) at the British Library, which reminded me of the piece I wrote for the Middle Grade Strikes Back Blog earlier this year on the topic of animals in middle grade fiction (books for 8-12 year olds). What strikes most of us working in children’s literature is the prevalence of the use of animals. Books teach us about our place in the world, who we are, how we live, and about how others live and feel. And animals give us a unique perspective – we only know what it is to be human by way of our relationship to what isn’t human – ie. that which is animal. Animals in literature provide several opportunities to play with experiences: they can be outsiders (as children are often portrayed in literature – looking in on an adult world); animals are wild – they show us how we once were wild ourselves, innocents – before we were tamed by society. Children are ‘tamed’ into adhering to the constraints of society – no adult lies down in the middle of Tesco’s and has a tantrum about not being bought the Frozen advent calendar (well, not that I’ve witnessed). Black Beauty by Anna Sewell is a perfect example of an animal being shunted around from pillar to post and made to behave – be tamed. And by being wild, and outside the rules of our world, animals and children can have more adventures – Where the Wild Things Are speaks to this. Judith Kerr’s bestseller, The Tiger who Came to Tea, may be set in a home environment, but the introduction of a tiger (the wild) makes it an adventure. One of the most thrilling animal adventures for children, SF Said’s Varjak Paw takes the domesticated cat and casts him off into the wild. The exhibition also drew attention to literature’s fascination with metamorphoses – humans turning into animals – from Actaeon in Ovid through to that poor family in Roald Dahl’s The Magic Finger. In Dahl’s story it is to teach the Gregg family that hunting is bad, In Beauty and the Beast – the man is punished for not showing kindness and so is turned into a beast. Both the family and the man are transformed back into their human forms in the end – the Greggs for repenting, and the Beast when he finds true love. Animals are also an accessible way to teach children about the environment. Although fracking and diesel pollution may be topical, for children seeing the damage an oil spill can inflict on a bird holds much more immediacy. The Last Wild by Piers Torday uses animals to ask children to address how we treat the world in which we live, as does Watership Down. Lastly, animals work as the perfect allegory. The anthropomorphism in children’s picture books allows us to address all those awkward issues which would be harsher and more direct if they were told using people. By using animals posturing as humans they teach us empathy – we see what it is that makes these animals human – they are wearing our clothes, and eating our food, and behaving as we do; their relationships with each other are human. Winnie the Pooh likes his little smackeral of something, and is a loyal and loving friend, The Very Hungry Caterpillar gets a stomach ache after all that delicious human food, The Cat in the Hat is our wild alter ego, the quick thinking mouse uses human cunning and logic to outwit The Gruffalo, and Farmer Duck is the quintessential animal with a human thought process. And I’ve talked previously about using animals to teach very young children about difficult topics such as death. 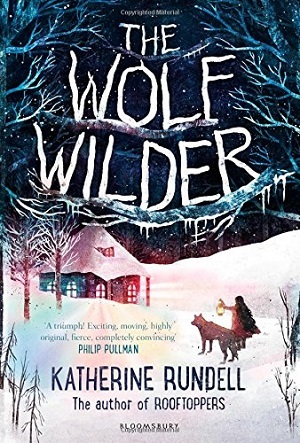 The Wolf Wilder is the latest book by Katherine Rundell. Wolves have long been a strong feature of children’s literature – an animal of choice. From the wolf’s threatening posturing yet ultimate comeuppance in Little Red Riding Hood and the Three Little Pigs (everything is little in comparison to him), to his wry stupidity in Clever Polly and the Stupid Wolf, to his prowess, strength and bravery in The Last Wild trilogy and Wolf Brother. Children are introduced to the wolf symbolised by the French horn in Peter and the Wolf and can be inspired by White Fang’s menacing yet ultimately tamed wolf. It is with the wildness and taming that Katherine Rundell starts her book. Feodora and her mother are wolf wilders: people who re-wild a wolf that has been wrongly or cruelly tamed (by the Russian aristocrats). 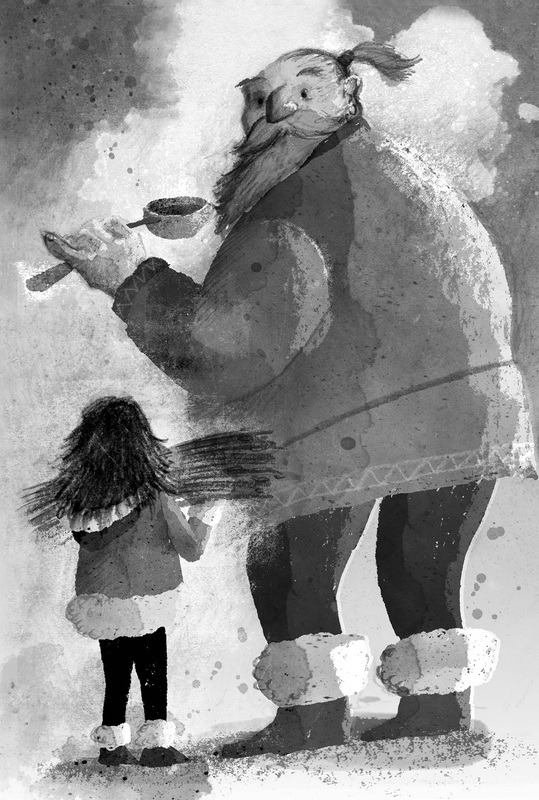 Feo and her mother live in the snowy woods of Russia. When their place in the world is threatened, and when her mother is taken away by the Russian Army, Feo has no choice but to flee with her wolf pack, and set in motion a search and rescue for her mother. and from the language on the first page the reader is hooked. Her childish innocence mimics that of the wolf cub she tries to protect; her feeling of being an outsider like the wolves; and her protectiveness of the environment in which she lives. The wolves behave as the animals they are in the book, and indeed the whole premise is that they should be re-wilded – tuned back to nature – but Feo herself has a relationship with them not unlike a protective loving relationship that one might have with siblings or very close friends. The characters are fierce and flawed and completely loveable – the reader can’t help but wish them to succeed in their endeavours – from Feo’s hunt for her mother, to Ilya’s fulfilment of his dreams. They stand up for what they believe in, and are ultimately brave in the pursuit of happiness. Rundell continues to weave this magic through the book, writing with apparent simplicity, and also wittiness, and yet each word carefully selected for its ability to paint a vivid picture in the reader’s mind. It’s the kind of book every child should read for its wonder and magic, and characterisation, and ability to transport the reader to another time and place. It’s only weakness lies in the plot similarities to Rooftoppers, Rundell’s prior novel, but it’s a minor point. Overall, one of the most beautifully written novels you’ll find for children. The kind of book, as Katherine Rundell says that “makes you feel taller…more capable of changing the world.” Read it to your child, otherwise you’ll miss out hugely! It’s a modern classic. For 8+yrs. There are some wonderful illustrations too, but I reviewed an early proof copy, which did not have them.